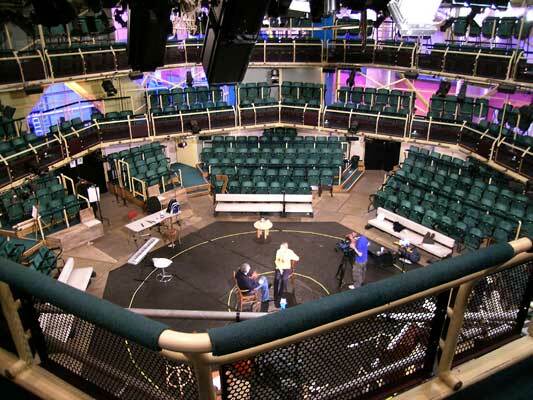 Is the Royal Exchange Theatre in Manchester haunted? The Royal Exchange Theatre is located right in the middle of Manchester city centre. The original construction was knocked down to make way for the more modern version in 1806 and was enlarged in 1847, and finally the made way for the current building in 1874 and was home to one of the countries larges traderooms for many years. A bomb dropped in the Manchester blitz of 1940 during World War 2 took it's toll on the building, destroying half of the theatre. The building remained empty until the mid-1970's when it was finally used as a theatre again. In 1996 a 3,300 pound IRA bomb exploded less than 50 metres away and caused considerable damage which took £32 million to repair. The refurbed building was opened once again in 1998 and thankfully still sees plays to this day. So why would a theatre of all places be haunted? And by who..? One of the creepiest places is the Wig Room. An unhappy female spirit is said to throw items around here, and she especially doesn't like white lillies. They're often thrown to the ground and wilt, uncontrolably for no reason. In the Green Room, the ghosts of a man in a dark suite and a glamerous blonde-haired woman have been seen, but their identities remain unknown. Much of the activity is said to be caused by bad energies within the building, they emmanate from left over energy from the WW2 blast which killed several people and 2 known suicides. One man is said to have killed himself by throwing himself of a balcony at a cotton exchange after loosing a considerable amount of money, also a young victorial girl is known to have taken her own life, for unknown reasons. It's said to be the excess energy from these deaths which feeds the spiritual activity. It's also reputed that the actor James Maxwell likes to return to the theatre in spirit form, probably because the building was close to his heart and he feels at home being one of the original founding members during the 1970s.